The Last Ship opens with a global catastrophe that nearly decimates the world’s population. Because of its positioning, the Navy destroyer U.S.S. Nathan James avoids falling victim to the tragedy. Now the crew and captain must confront the reality of their new existence in a world where they may be among the few remaining survivors..
Eric Dane (Grey's Anatomy) stars in the action-packed military thriller THE LAST SHIP from blockbuster filmmaker Michael Bay (Transformers). Based on the best-selling novel by William Brinkley, the series opens with a global pandemic that has nearly decimated the world's population. After four months of radio silence in remote Antarctica, the crew of the U.S.S. Nathan James is heading home with microbiologist Rachel Scott (Rhona Mitra) .. 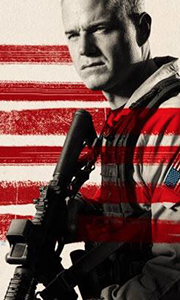 Season two of The Last Ship begins with a cure for the Red Virus and the goal to save the human race. Navy Captain Tom Chandler and his crew return to the States unsure of what they will find. As the crew seeks to find survivors and their families, they encounter a new, emerging enemy who’s vying for control and may hinder the mass production of the cure. Starring Eric Dane and Rhona Mitra, all 13 episodes from The Last Ship Season 2 ar.. In Season 3 of The Last Ship, the crew of the Nathan James is shifting attention to Asia after President Michener hears that the Chinese leader has been hoarding the "Scott cure" instead of distributing it to people in the region. Michener sends Chandler to a global summit to investigate this allegation, as well as rumors of a possible mutation of the original virus. The season 3 Blu-ray & DVD release also come packed with bonus content.. In the final season of The Last Ship, the world is finally recovering from the deadly virus that devastated the population, but global political unrest remains. Tom Chandler (Eric Dane) has retired and his former crew has scattered, many having risen in the ranks within the Navy. Sasha Cooper (Bridget Regan), Lieutenant Danny Green (Travis Van Winkle), SBS WO-N Wolf Taylor (Bren Foster) and Sergeant Azima Kandie (Jodie Turner Smith) are..